Today, your company can proudly partner with America’s green team, professional American Basketball Association (ABA) League team, Texas FUEL. This exceptional team is located in a city where basketball has rich history dating back to days when San Antonio Spurs played in the old American Basketball Association (ABA). ABA is again, now alive and well, thriving with Texas FUEL and dozens of other professional league teams. ABA players are committed to taking professional ball games to your city fo families can enjoy this all American activity at affordable prices, unlike NBA games. Just as San Antonio is synonymous with basketball, Texas is synonymous with oil. Texas FUEL is merging these as a rich opportunity to teach Americans, old and young alike, about alternatives to oil, renewable energy. Texas FUEL not only leads as #1 in the SW Conference and 10th in the nation. Texas FUEL is also championing green energy, educating inner-city youth and fans each week about sustainable energy, helping put fuel back into hands of the common person. In so doing, Texas FUEL is fostering national security, economic security, preventive health care and world peace. The FUEL team, comprised of outstanding young men of integrity, was inspired and empowered by the eco-peace movie, FUEL. In fact, the movie inspired these young men so much, they changed their team name to FUEL and committed to spreading this award-winning documentary's messages about renewable energy and peace. Texas FUEL half-time shows consist of edutainment provided to as many as 16,000 fans in the stadiums who watch and learn about renewable energy through solar, wind and biofuels. Shooting Stars Basketball Academy provides Texas FUEL mentoring and leadership through basketball. It literally turns youth dreams into realities. Whether it's a green science project, making the junior high team or the high school varsity, earning a college scholarship, or playing at the professional level, FUEL players at the Academy are there to ensure all youth participants have the support they need. FUEL players recongize that basketball is an extension of life. Trials and lessons in basketball are helpful tools for lessons of life. In todays' society, children require the surroundings of good mentors, caring individuals that uplift our youth into adulthood. Texas FUEL professional basketball team players admirably provide these assets to Shooting Stars, mainly inner-city youth. Consistent with FUEL's green mission, they are role models in green living and teaching the Shooting Stars valuable lessons in green living. It is working so well, Shooting Stars attend FUEL games, proudly carrying placards reading not only "Go FUEL," to promote the team and the movie, but also, "Go Green!" This program is auspicing the April 2,500 Inner-City Youth FUEL Project. This project needs individuals to "FUEL it Forward" by sponsoring 1 ticket at $10.00 each, a simple way to maintain the academy and the team! Please learn more about this unique humanitarian and environmental project here where you can ensure that your one gift becomes three. A hearty congratulations to this team, now ABA Southwest Division of Southern Conference Champions! The other great news is that now you can partner with these all American, green team Champions. Have your banners with your company's name and logo at all of the games. Have your name and logo recognition on printed materials. Get recognition on numerous media offers now coming into the team, special opportunities as America is becoming aware of this new, ABA team of Champions, its first green team. Contact Deborah Dupre' Associates for EcoPeace International today to learn more and see Texas Fuel's sponsorship package so your corporation can partner with America's first and only green team. Phone (011) 310.310.1997 or email info@DeborahDupre.com. For more information about Texas FUEL Partnership opportunities, click here. You can soon be part of America's green team, Pro-Basketball ABA Team Champions. An American professional basketball team saw the movie FUEL. 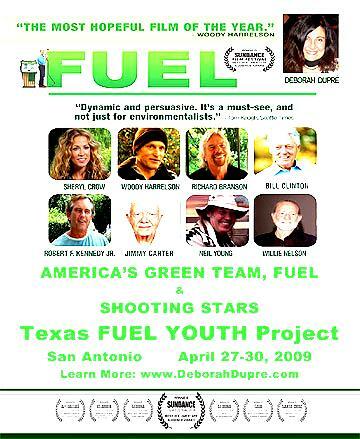 This film inspired and empowered them so much, they changed their name to FUEL, changed their mission to being America's First Green Team and spreading the peace and environmental messages in the movie; and even changed the jerseys with FUEL on the front and the motto, "Change Your Fuel, Change the World" on back of them. Not only are these pro-basketball players spreading the clean, peaceful message by having it written on their backs all while they play. They have also created halftime shows for stadiums filled with as many as 16,000 fans, edutainment about renewable energy. FUEL basketball players mentor inner-city youth, Shooting Stars. The "FUELing forward" reached these youth, and then the team fans, and then their opposition teams and their fans... Texas FUEL, under as much grueling challenges as Josh Tickell met in his pursuit to change the world, reminded themselves that if Josh could do it, so could they. FUEL team heroically earned the title of Champion in the SW Conference. The team then went on to the finals where individual players and Coach Minifee earned numerous other awards. Video produced will then be the greatest marketing/fund-raising tool for Shooting Stars and Texas FUEL's next season so they can continue learning and spreading the Green and Peaceful messages highlighted in the movie FUEL. Target: S. Texas Inner-city Youth. Because countless inner-city disengaged youth who have seen FUEL in S. Texas already have reported in confidence to their teachers that since seeing it, "I know I now have a reason to live." Your donation of $10.00 means one more youth has reason to live because s/he sees FUEL plus Texas FUEL Pro-basketball team continue mentoring innercity youth and spreading the Green message throughout the country. Thank you for your generous support for betterment of humanity! 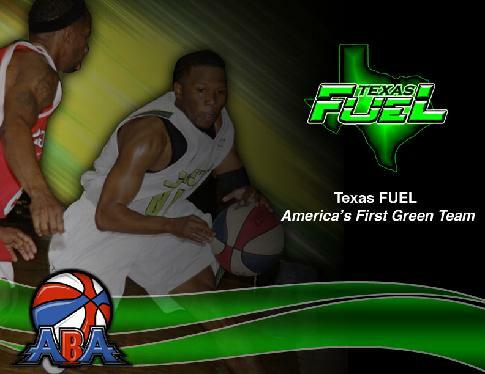 America’s first green team, Texas FUEL arrived home in San Antonio today after receiving numerous honors at Municipal Auditorium in Nashville, Tennessee where the American Basketball Association (ABA) Best of the East met the Best of the West Sunday. Texas FUEL forward, Keith Simpson, San Antonio native and Lee High School graduate, was named Most Valuable Player (MVP) of the 2009 ABA All-star Game and 1st Team ABA Western Conference for the 2008-2009 season. UTSA graduate, Isaiah Allen, Texas FUEL guard was named Co-Rookie of the Year for the ABA 2008-2009 and was also named 2nd team ABA Western Conference. Milwaukee, Wisconsin native, Ben Hebl, Texas FUEL Guard, earned ABA 3pp Competition Runner Up in Nashville this past Sunday. Texas FUEL had four participants in the All-star Game, including Keith Simpson, FUEL forward, and Isaiah Allen, FUEL All-star guard, both from San Antonio, Albert Strickland, All-star FUEL forward of Detroit and Waymon Powell, All-star FUEL guard of Los Angeles. Texas FUEL head coach, Chicago native, Marlon Minifee was honoured as Western Conference All-star Team Coach of 2009. The ABA All-stars of the West, in which four Texas FUEL players were selected, defeated the All-stars of the East in Nashville. Consistent with their green commitment, Texas FUEL is raising funds for two projects planned for the near future. The first project, thanks to the movie, FUEL's director, Josh Tickell, is for the the team's education outreach program to target 2,500 San Antonio inner city youth to have opportunity to see the movie, FUEL that inspired the team to Go Green and change its name to Texas FUEL. FUEL’s second project is to build America’s first wind-powered gymnasium and education facility. For more information about America’s first green team, Texas FUEL, contact EcoPeace International, 310.310.1997 or info@ecopeaceinternational.com.